Enjoy our selection of Dutch oven recipes, delicious cooked at camp or at home! I would like to thank you for visiting DutchOvenNet.com and hope that you will find this a useful resource for learning and teaching the art of Dutch oven cooking. Although not a chef, I have enjoyed cooking for as long as I can remember. My mother started teaching me the basics of cooking from scratch before I even started grade school and I’ve been cooking ever since. I get a lot of satisfaction from teaching others how to enhance their outdoor experience by simply eliminating processed foods from their cooking plans and getting back to basics. I developed an interest in Dutch oven cooking after I got involved in Scouting with my son. Occasionally I would notice a troop turning out some pretty impressive deserts using these black pots heated with charcoal. I was curious, but didn’t really explore the art until after I took over as the troop’s Scoutmaster. At that time the boys were usually eating heat and serve processed foods, basically garbage foods with lots of sodium and sugar but with little nutritional value. It was pretty clear that the boys really did not know how to cook much of anything else. 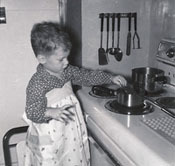 They weren't learning to cook at home as I did as a boy. I finally decided to introduce the Scout troop to Dutch oven cooking in 2002 while I was taking BSA Wood Badge, an advanced leadership training program for Scout leaders. Part of the program is to develop and work a ticket which is a group of goals one will use to improve themselves and their program. One of my goals was to introduce my Scouts and Scout Leaders to the art of Dutch oven cooking. It took time and effort, but the result was well worth it. The Troop’s outdoor program was greatly improved and the boys have since been cooking and eating much better. Though I have since passed the torch of leadership, I still enjoy introducing Scouts and Scouters to Dutch ovens and to the benefits of cooking from scratch. I hope that you enjoy this site and that you will also use the information presented as a resource to teach youth the art of Dutch oven cooking. A Cub Scout and a Boy Scout as a youth, I have been involved in Scouting for over 20 years. I have served the youth in my community as an Assistant Scoutmaster and Scoutmaster and I continue to serve as a Troop Committee member. A district level trainer since 2005, I am currently serving as the District Training Chairman for the Chippewa District of the Great Trail Council. 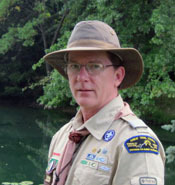 I took BSA Wood Badge in 2002, completing my ticket in 2003. Since then I have served on staff for BSA Wood Badge, BSA Powder Horn and as a course director for the BSA's National Youth Leader Training program. In addition, I have staffed a wide variety of Council and district training programs such as The Trainer's EDGE and the University of Scouting. I have also directed multiple Introduction to Outdoor Leader Skills programs. While I have been recognized with awards such as The District Award of Merit and BSA's Silver Beaver, I receive the most satisfaction from the collection of Eagle Mentor Pins presented to me by some of the young men whom I helped to mentor. Our future is in our youth and we owe it to them to do what we can to help them build a strong foundation upon which they can build their future. Along with my wife Pat, who helps develop our recipes, it is my sincere hope that you will use DutchOvenNet.com as a resource in your own youth mentoring efforts, be it in the community or in the home.